The World Obesity Day is celebrated on 11th October every year. It is organised by the World Obesity Federation, a non-profit body which is in official relations with the WHO. The day revolves around raising awareness about obesity as a public health hazard and its serious concerns along with promoting practical solutions to end the global obesity crisis. Being overweight and obese is a medical concern and not just an appearance issue as it causes health damages. A recent study estimates that around 2.7 billion adults worldwide will suffer from overweight and obesity by 2025. Moreover, not to forget, untreated obesity is responsible for conditions that increase the risk of many health problems, including Heart Diseases, Cancer, Diabetes to name a few. On this World Obesity Day, we spoke to weight-loss specialists, bariatric and metabolic surgeons from across the country about major obesity-related health problems and ailments that are becoming increasingly common globally. Before, we begin to discuss the common health problems caused by obesity. Let us first try to list down as to what’s the ideal weight to be maintained for a healthy overall well-being. Determining one’s ideal body weight is important. The following two methods help in determining whether a person is overweight or obese or not. Body Mass Index or BMI: BMI helps in determining whether a person has normal weight, is underweight, overweight, or obese. This method measures one’s weight to one’s height and provides a score. The person is of normal weight, underweight, overweight, or obese depending on this score. Any person with a BMI of 25 or higher is overweight and with a BMI of 30 or higher is obese. Waist Size: Having too much fat around one’s waist may increase health risks. Women with a waist size of more than 35 inches and men with a waist size of more than 40 inches have higher chances of developing diseases related to obesity. Being overweight and obese cause resistance to insulin, the hormone that regulates blood sugar. As a result, the blood sugar does not reach the cells which generate energy. This leads to Type 2 Diabetes. The heart pumps blood through the arteries to the various part of the body. The heart has to pump extra blood to supply extra oxygen and nutrients to the fatty tissue of an overweight or obese body. This extra circulation of blood causes extra pressure on the artery walls, thereby increasing the blood pressure. High blood pressure or Hypertension usually has no symptoms, but it may cause serious problems, such as Heart Disease, Stroke, and Kidney Failure. Additionally, extra weight can increase the heart rate and reduce the body’s ability to transport blood through the arteries. The heart of an overweight or obese person has to work more than the heart of a normal weighing person. This leads to the heart arteries becoming hard and narrow. Overweight and obese people are hence, more susceptible to various Heart Diseases, such as Atherosclerosis or hardening of the arteries, Coronary Artery Disease or fatty deposits in arteries, Angina or chest pain caused by narrowing of the arteries, and Heart Attack. Also, read about Healthy Lifestyle for Health Heart Article. High blood pressure leads to narrowing of the arteries which in turn leads to decreasing of blood flow to the brain resulting in a Stroke. Excess weight also increases the chances of developing other ailments linked to Strokes, such as High Cholesterol, High Blood Sugar, and Heart Diseases. Though not scientifically proved, fat cells may release hormones that affect cell growth, leading to Cancer. Overweight women are susceptible to Cancers of the breast, colon, gallbladder, and uterus. Similarly, men are susceptible to Cancers of the colon and prostate. 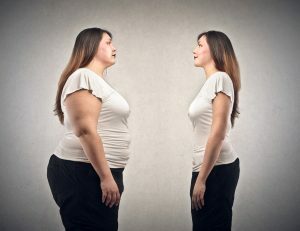 Read more about the same at Obesity and Cancer: Are They Related Article here. The excess weight of the chest wall tends to squeeze the lungs which result in breathing problems. Overweight people experience Sleep Apnea which is a disorder where the patient suffers from interrupted sleep, snoring, sleepiness during the day and stopping of breath for short time periods. The increased weight of the body places extra pressure on the body joints, such as the knees, ankles, and hips. Physicians do not recommend Joint Replacement Surgery to people who are overweight as the artificial joint has a higher risk of loosening and causing further damage. Fatty Liver Disease or Nonalcoholic Steatohepatitis (NASH) occurs when fat builds up in the liver and causes injury. Fatty Liver Disease at times leads to severe Liver Damage, Cirrhosis, or even Liver Failure. Being overweight results in diseases, such as Diabetes and Hypertension that in turn lead to Chronic Kidney Disease. An overweight pregnant woman is more susceptible to developing Insulin Resistance, Diabetes, and High Blood Pressure. She is also at a higher risk during anaesthesia sedation and surgery. Being overweight or obese causes an increased risk of having abnormal levels of blood fats which include high levels of Triglycerides & LDL or Bad Cholesterol and low levels of HDL or Good Cholesterol. Obesity Hypoventilation Syndrome (OHS) is a breathing disorder that affects some overweight and obese people. At times it leads to serious health problems and can even cause death. On the occasion of World Obesity Day 2017, we would like to educate our audience on the fact that, being overweight may cause menstrual issues and infertility in women. Overweight or obese people are at a greater risk of having gallstones. They may also suffer from an enlarged gallbladder. People often blame overweight and obese people for their situation. Such people become psychologically weak and at times suffer from low self-confidence and depression.